This weekend, Bristol Transformed will welcome hundreds of people to its events. Its organisers see the project as part of a broader mission to rebuild collective culture. 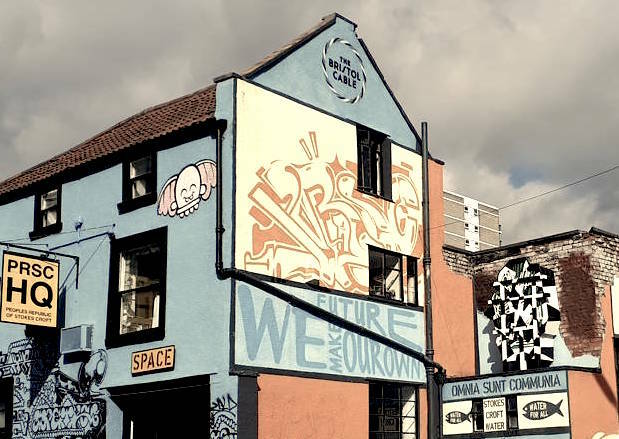 The People's Republic of Stokes Croft, where Bristol Transformed will host a number of its events. There is an epidemic of alienation and loneliness in Britain that is leading to mental and physical ill health of thousands of Britons. Just last year, the government appointed a ‘minister for loneliness.’ This symbolic attempt to address the problem is, of course, woefully insufficient while Tory austerity continues – every year brings more cuts to social spaces, support services and the local and national programmes that sustain community life. One recent study found that “over 9 million people in the UK across all adult ages – more than the population of London – are either always or often lonely.” These findings are not isolated, but form part of an international trend. According to the World Health Organisation (WHO), depression will be the leading global health issue by 2030. Loneliness is a profound social problem that extends beyond the boundaries of age, race, or class. It is also integral to the neoliberal society. In her book Undoing the Demos, Wendy Brown argues that although neoliberalism has far-reaching economic consequences that undermine democracy, the ideology reaches further and also “takes shape as a governing rationality extending… to every dimension of human life.” The impact of neoliberalism is not contained to just the economic or political spheres, but radically transforms our social lives as well. Beyond even direct cuts to things like care and community services, neoliberalism atomises individuals, leaving them disconnected from their community through increased marketisation. This is not something neoliberalism’s advocates hide. Their preferred model of human society – expressed by the Rational Choice Theory so popular in contemporary political science and economics – casts us as ‘utility maximising individuals,’ treating each interaction as an opportunity to maximise our gain and minimise our losses. This ‘homo economicus,’ inevitably has little time for those parts of our lives which do not conform to this profit-seeking behaviour. It is incumbent on the Left, with its social politics, to resist this current culture of isolation. We can do by creating collective spaces and mass organisations – and using these to bring people together around common understandings. A crucial aspect of this will be political education, which empowers people to fight back against atomisation. This thinking has influenced us to organise Bristol Transformed, an upcoming event that celebrates left culture and politics, intends to raise awareness of the forces that destabilise our social world and encourage people to take action to build stronger communities. As we continue fighting for a Labour government that will put policies in place to help reverse the trend of loneliness and ill health, we must also do all we can to expand our movement and create real connections with one another. The three-day event aims to include a spectrum of collective activities. It will, of course, include panel discussions. But there will also be interactive workshops, daytime activities ranging from scrapbooking and screenprinting, and evening activities from pub quizes and spoken word poetry to live jazz performances. Even the food provided will aim to emphasise these themes, being provided by Arawelo Eats, a Somali organisation that explores racism and identity through its food. We are delighted to have Tribune as media partner at the event – with its writers featuring in discussions about media alternatives, the need for social housing and international solidarity. If you are free this weekend and interested, please join us. We need a revival in collective culture and experience across the country, and Bristol Transformed will be our first step to this end. Hopefully, many more can follow. Bristol Transformed takes place from April 5-7th. Tickets are available here. Kulsoom Jafri is a volunteer organiser for Bristol Transformed and is a member of the Momentum Bristol Organising Group.